And such was the case in many homes across Cote Saint-Luc on Tuesday night. Our night out began after 10:00PM at the home of Joe and Dolly Gabbay. They welcomed my wife, Judy, and me, with open arms, along with our friends, Mayor Mitchell and Elaine Brownstein, MP Anthony Housefather and Councillor Sidney Benizri. Joe explained that a whole fish is traditionally placed on the table to symbolize fertility and good fortune while many of the sweet pastries were prepared well before the Passover holiday, frozen and symbolically sold, as not to posses chametz during the holiday. It wasn’t long before the Gabbay home was filled with people including our D’Arcy McGee MNA, David Birnbaum as well former MNAs from the same riding, Lawrence Bergman and Judge Herbert Marx. Israeli Consul General Ziv Nevo Kulman was also in attendance. It is customary to spend a little time visiting the host family’s home before moving on to other homes. After a beautiful spread at the Gabbay home, including Moroccan pastries, Mofletta, coucous, cheeses, fruit and smoked salmon, wine and spirits it was time to move on for the next late night visit. A wonderful welcome and magnificent display in the Gabbay dining room. Many thanks to Joe and Dolly for their warm hospitality. Our group of friends traveled down the block to the beautiful home of Lison Benarroch who greeted us in traditional attire to a lavish presentation. The renowned business woman transformed her dining room into an opulent display of North African inspired sweets, nuts, candies and fruit. As if that weren’t enough there was sushi, lox, wonderful cheeses of all sorts and fresh baked loaves of bread. There was an endless stream of well-wishers who kept arriving to Lison’s lovely home. Strangers and friends alike mingled easily offering greetings of Tarbukh, May you have good luck. As we were heading out yet another former politician walked in, none other than Former Minister of Justice and Attorney General of Canada and MP for Mount Royal Irwin Cotler and his wife Ariella. Thank you Chantal and Emanuel for such generous hospitality and for an absolutely delicious assortment of treats. My sugar level and calorie intake reached an all time one night high but I’ll worry about that tomorrow. Tonight I am so pleased to have been reacquainted with such friendly and welcoming Cote Saint-Lucers such as the Gabbays, Benarrochs and Bekhor-Castiels. On behalf of my family and my great friends Mitchell and Elaine Brownstein, Anthony Housefather and Sidney Benizri, thank you so much for your hospitality, and sharing your Mimouna with us. We are blessed to live in such an amazing community in Cote Saint-Luc – a vibrant, rich and caring community, a wonderful multicultural family. I wish you all Tarbukh, success and good luck. And now, my treadmill awaits! With a signature and a solemn oath Cote Saint-Luc’s new Councillor for District 7, Sidney Benizri, was sworn into office this evening and began his official duties. With ceremonial duties complete Benizri wasted no time in bidding farewell to his wife, Sandra, and children Kelly, David and Yoel, as he was ushered into his first closed door meeting, in preparation for his first public meeting taking place this evening. Councillor Benizri will be sworn into office on Tuesday, April 19 and will appear at his first Public Council meeting that evening. Come and join the council in welcoming Councillor Benizri at the 8pm public meeting. Le Conseiller Benizri sera assermenté le mardi 19 Avril et apparaîtra lors de sa première réunion public du Conseil ce soir-là. Venez rejoindre le conseil pour accueillir le conseiller Benizri au réunion publique à 20h00. New District 7 councillor Sidney Benizri, left, is congratulated by Côte St. Luc mayor Mitchell Brownstein. Sidney Benizri won Sunday’s Côte St. Luc council by-election Sunday, and will be sworn in this week as the new councillor for District 7. Benizri, the first member of the Sephardic Jewish community elected to Côte St. Luc council, is the national executive director of Canadian Magen David Adom for Israel, which fundraises to send ambulances to Israel. He replaces former longtime councillor Mitchell Brownstein, who was recently acclaimed mayor of Côte St. Luc. According to the final election results, Benizri received 325 votes, to David Tordjman’s 221, Mitch Kujavsky’s 205 and Lloyd Pedvis’s 20. Benizri added that he will study the concerns conveyed to him during his meetings with residents door-to-door during the campaign. Brownstein was on hand to hear the results, as were councillors Ruth Kovac, Allan Levine, Mike Cohen and Mount Royal MP Anthony Housefather, former mayor of Côte St. Luc. Brownstein said he is also pleased to have a member of the Sephardic community on council. “But I know he is someone who will serve everybody in the community very well,” the mayor added. Congratulations to Sidney Benizri, Cote Saint-Luc’s newest City Councillor. Elections for District 7, to replace the seat previously occupied by Mayor Mitchell Brownstein took place today (Sunday, April 10, 2016). With all polls reporting in as of 9pm the unofficial count shows Benizri captured the seat with 324 votes. 230 votes went to former city employee David Tordjman, 223 to accountant Mitch Kujavsky and 20 for computer consultant Lloyd Pedvis. Benizri and I go way back, working side by side at Federation CJA from 1995 to 2000, literally sharing an office. I served as Director of the Young Adult Division, Young Leadership Campaign and Jewish Chamber of Commerce while Benizri served as Assistant Director. I have followed his career closely and remained good friends ever since yet I had to remain neutral during this by-election campaign. I look forward to continuing to work with Sidney after a break of so many years, and kind of sharing an office once again, this time as equal partners in this great community initiative. He certainly deserves accolades today. District 7 candidates Mitch Kujavsky, David Tordjman, Sidney Benizri and Lloyd Pedvis with Mayor Mitchell Brownstein. Benizri took the by-election with a 100 vote lead. Congratulations as well to Lloyd Pedvis, Mitch Kujavsky and David Tordjman. Pedvis is interested in community issues and often emails me about his area. I hope he continues to do so. He jumped in with two feet not really sure how things would go and gave it his best. He had a good attitude all along. I met Kujavsky and his wife Jordana in the last couple of years as they got involved in the CSL Dramatic Society and we all worked together on Anthony Housefather’s campaign for Parliament. He is a likable, easy going and funny accountant (imagine that) with a knack for the stage. He too is interested in seeing our community improve and I hope he stays involved. I’ve known Tordjman through his former role working for the city. He spent the last few years working on infrastructure projects in Haiti. I wish him lots of luck in his upcoming marriage. Another chapter in CSL electoral history opens with Sidney Benizri taking over in District 7. I am confident he will do a fine job, together with his new colleagues on City Council, as we all strive together to continue to make Cote Saint-Luc the fantastic city that it is. 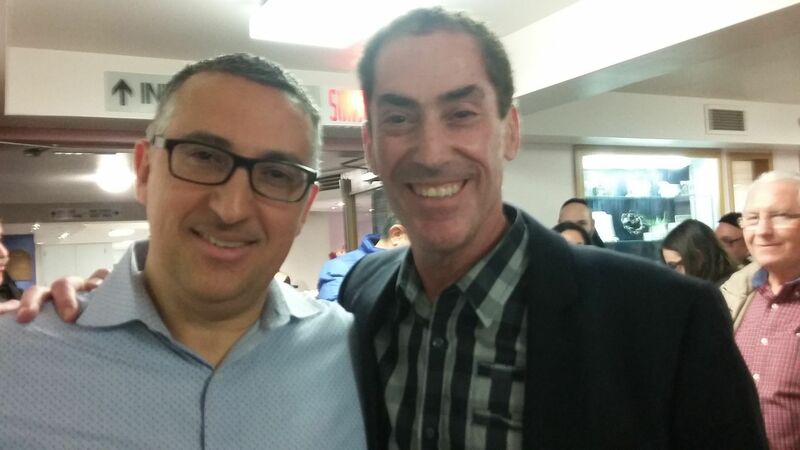 With advance polls set for Sunday, April 3 and the by-election date for Côte Saint-Luc District 7 a week later – Sunday April 10 – we are in the midst of a spirited race to see who will succeed our new Mayor Mitchell Brownstein as the city councillor for that area. District 7 encompasses the homes and buildings near Mount Sinai Hospital, Hebrew Academy, Congrégation Or Hahayim and St. Richard’s Church. Here is the complete map. Mayor Brownstein and council with the candidates. There are four candidates vying for the seat: Sidney Benizri, Mitchell Kujavsky, Lloyd Pedvis and David Tordjman. Harvey Levine, executive director of B’nai Brith Canada, Quebec Region chaired the evening and B’nai Brith Canada legal counsel Steven Slimovitch served as the moderator. Since Côte Saint-Luc was reconstituted, we have never had such a candidates meeting. For the residents who turned out, it was a difference maker. They had this unique opportunity to hear each candidate respond to some well thought out questions by Levine and Slimovitch. Each one of these gentlemen handled themselves very well, with opening remarks, closing statements and pretty good answers to questions they could not prepare for. Slimovitch asked them about traffic calming near the two schools in the district, quick access out of the city despite traffic on Heywood, new ideas they had for the district, the Cavendish extension, library services, prohibiting parking in some high traffic areas, upgrading parks and snow removal. For full details on the by-election click here. We have delayed our next public council meeting until Tuesday, April 19 in order for the new councillor to join us. District 7 candidates Mitch Kujavsky, David Tordjman, Sidney Benizri and Lloyd Pedvis with Mayor Mitchell Brownstein in the Council Chambers. Who will be the successful candidate? The four candidates for Côte Saint-Luc District 7 will meet the public on Tuesday, March 29, 2016 from 7:30 pm to 9 pm at City Hall (5801 Cavendish Blvd.) in Meet-the-Candidates event hosted by B’nai Brith Canada, Quebec. The by-election to elect a new councillor in District 7 takes place on April 10. The seat was left vacant by Mitchell Brownstein who resigned his seat before being acclaimed as Mayor of Côte Saint-Luc. The four candidates in contention for a council seat are, in alphabetical order: Sidney Benizri, Mitch Kujavsky, Lloyd Pedvis, and David Tordjman. The candidates will make opening and closing remarks and each will answer questions from the moderator on relevant issues of concern to the district residents. Mayor Brownstein will open the event. There will be closing remarks from Côte Saint-Luc resident Gerry Weinstein, who is Past President, B’nai Brith Canada and President of Residence B’nai Brith House and the soon to be built Chateau B’nai Brith — both in Côte Saint-Luc.